is located on Lycoming Creek, 25 miles north of Williamsport. Beginning in 1828, coal and iron were mined there. in an early map of the Williamsport & Elmira Railroad. that was built from Williamsport to Ralston between 1834 and 1837. (By the time Ralston was reached, requiring fourteen bridges over the serpentine Lycoming, the money was exhausted and building ceased for nearly twenty years). and it came to be known as the Williamsport & Elmira Railroad. 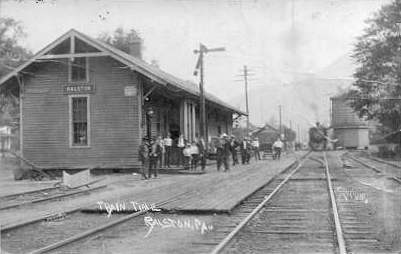 The Ralston train station c. 1900.
one store, two hotels, and a post-office. and its growth for several years past has been slow. J. W. Kilbourn runs a general store". 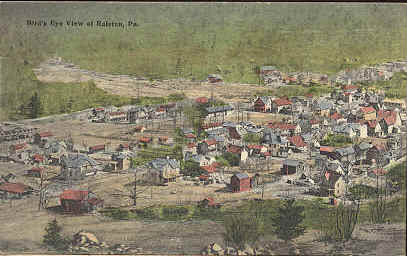 A bird's eye view of Ralston, c. 1920. 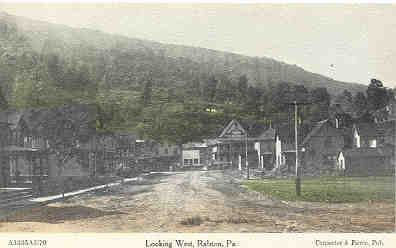 A view of the village of Ralston, looking west, c. 1920. By 1907 all the timber had been taken from the mountains. there were strikes in the mines for higher wages. to operate at a profit, so mining was finally discontinued. The tannery was the remaining employer, as was the railroad passing through. The tannery burned c. 1926. The railroad ceased to run c. 1954. Ralston would grow no more.